These guys clean up pretty well! 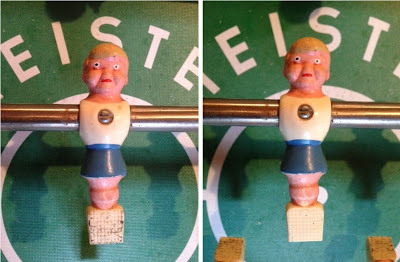 Considering that these foosball men have gotten progressively filthier from the time this table was installed, in a bar/roller rink/whatever in the 1970's, I really couldn't have asked for better results. We're talking about 30+ years worth of dust and grime and spills. Of course, when you clean off 40 years of filth, some paint comes off, too. Frankly, the paint comes off every time you touch these players. It's really old paint. On the one hand, that's a shame - I'd like to keep as much of the vintage hand-painted folk-art aspect of this table as I can. On the other hand, whoever hand-painted these guys back in the 1970s had an amazing talent for making the players look CRAZY. You can see that some of Rooney's pants wore off, with some very light cleaning. 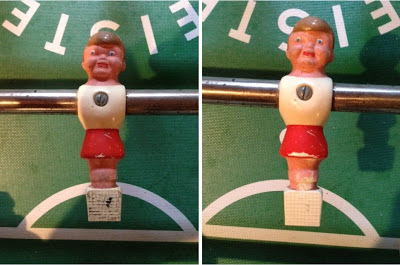 I'm going to have to research what style of paint should be used on foosball men... there's going to have to be some touch-ups at a minimum, and potentially a total repaint for all 22 men. A lot of the paint has worn off - and it's gotten worse as I've cleaned the filth away. But even more troubling - the paint seems to be degrading. All of the players are a little bit sticky to touch. And even if I repaint, it's not like I could do *worse* than the original paint jobs. The faces are a mess (way too pink, with eyes like Sloth from the Goonies), and the legs are mispainted. There's supposed to be a red or blue "sock" stripe there, but it's all pink. We're restoring this thing - we can do better! So it's decided. We'll keep the original players, with the "waffle print" feet - but they're all coming off, getting scrubbed white, and getting completely repainted. As an aside, we had a dinner party a couple of weeks back, and at one point in the night I gave a tour of the new house, which eventually led to the basement, which immediately led to a few a heated games of foosball. I got TROUNCED. 10-2. And it felt great! I've never been so happy to get thoroughly outclassed at anything. 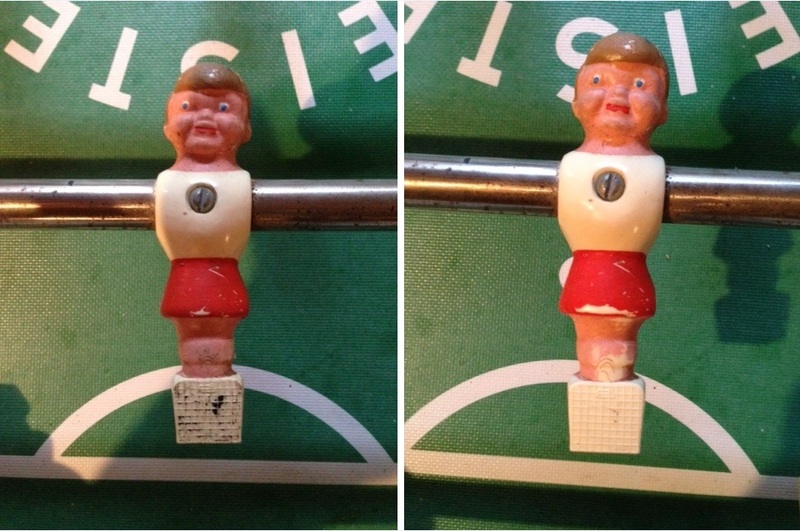 If I'm going to spend some time, energy and cash rehabbing an old foosball table, it's good to know that my friends not only remember foosball, but can absolutely destroy me at it.